Father Milton Wright, the Bishop of Dayton, Ohio, fumbled with the latch of the wicket gate with one hand while clutch­ing a fairly large – sized parcel in the other. His sons Wilbur and Orville noticed him, raced to the gate, lifted the latch and held the gate open. "Thank you, my boys", Father Milton Wright beamed a happy smile, handed the parcel to Wilbur and said, "That is for you, boys". Wilbur and Orville ripped the packet open. They screamed with joy when their eyes fell on the toy heli­copter. They played with it. Its movements roused their cu­riosity. Their quest for more information on flying led them to mythological stories and from there to reports and records of the work of pioneers who had taken the quest forward. On an earlier occasion, Father Milton had gifted bicy­cles to the two boys. Cycling had become an obsession with them. They cycled the countryside, sped along the alley­ways. They hardly found time for regular studies. "What do you propose to do?" Father Milton asked them, once it became clear that they didn’t do well at school. "We plan to open a cycle repair shop", Wilbur replied. "Whatever you do, try to be the best. Be honest in your dealings. Be friendly to people. Earn a good name", the Bishop gave his assent. Wilbur and Orville set up a shop. They always did a good job. They were polite to the clients. Their charges were reasonable. So their business flourished. In their spare time, they fabricated more efficient bicy­cles. They had easy access to wheels and spokes and ribs to create new designs. Often they rode their new designs, over long distances, getting a measure of the resistance that wind exercised, when the vehicles moved fast. These escapades gave them clear insight of wind force and air currents. This knowledge stood them in good stead when they set out on the quest to fly. They got a copy of the book, Progress of Flying Machines by Chanute and read it several times. It taught them how to prepare models of kites and gliders. In May 1900, Wilbur wrote to Chanute, "For some years, I have been afflicted with the belief that flight is possible to man. My disease has increased in severity and I feel it will soon cost me an increased amoun.^of money, if not my life". Chanute encouraged him to continue the work. The Wright brothers spent all their spare time, testing gliders. They conducted more than a thousand test flights. Some of these tests were in wind tunnels, specially made to match the behaviour of gliders under varying wind condi­tions. These experiments taught them the importance of the direction of the wind and the speed of the air current in controlled flight. Their success would depend on choosing a suitable site where wind conditions would be favourable. From the United States Weather Bureau, they obtained a list of ‘windy, treeless, level’ sites. They examined the suit­ability of each of the sites. Finally they selected the sandy Kill Devil Hills, 6 km south of Kitty Hawk, North Carolina. Wilbur noted. This led to ‘wing warping’, a concept in use on aircraft even today. Wilbur and Orville patented this de­sign later. "Can’t we mount a gas-driven internal combustion engine on a glider? It should work", Wilbur turned to Orville and Charles Taylor, a friend. He was also a good mechanic, who helped the brothers in their experiments. "It should", Charles replied, spontaneously. "It should, if the engine is light and hardy", added Orville. The three men searched for long for a suitable engine. None was available. So they set down to fabricate an en­gine. They cast the engine’s body and the crankcase out of a single piece of very thin, light aluminium-copper alloy. It was a four-cylinder 12 hp engine, fuelled by gasoline. 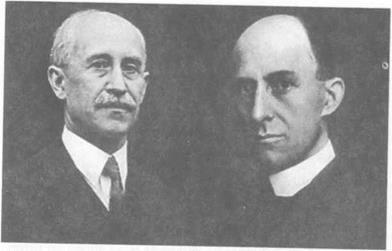 Wilbur and Orville prepared the blueprints for the airplane and started fabricating it. It was a model with four wings. (That made it a biplane. Monoplanes have two wings). The wings were made of wood and covered by tough linen. Reinforced wires joined the wooden struts. The wires ran from a cradle-like device, on the lower wing. The cradle provided room for the pilot. It served as the cabin. He could lie in this cradle and shift his weight around to move the tips of the wing up or down. A tail rudder was added to provide stability while taking turns. Two pusher propellers were linked to the engine by bicycle chains. At last, the brothers were ready to fly the crude con­traption. They called it, The Flyer. Preparations began in right earnest for the flight. Hard wooden rails were laid on the sloping hills. On it rested a trolley with wheels. The airplane was loaded on it. A cable connected the trolley to a pulley on top of a tower. Its free end ran over the pulley and was held down by weights. Once the weights were removed, the trolley would slide down the slope, pick up speed and provide the necessary thrust for the aircraft to get airborne. Fig. 2.1: The Wright brothers’ Flyer (1903)—first man-carrying powered sustained flight. 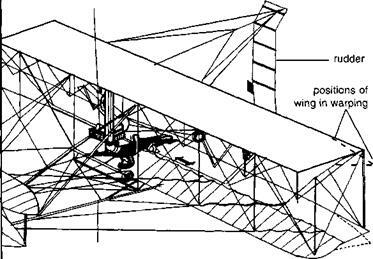 On 14 December 1903, Wilbur climbed on to the lower wing and lay flat on his stomach. His hips slid into the pad­ded wing-warping cradle. Orville made the last-minute ad­justment to the motor. The propellers provided immense thrust. Orville and a friend, Will Dough, released the weights. The trolley rolled on, picked up speed. Orville ran beside the plane, balancing it with one hand. The Flyer lifted off (Fig. 2.1). Wilbur pulled the elevator sharply upward. (The elevator is the control mechanism that helps the pilot gain or lose height according to need. Lay men refer to the elevator as the rudder.) The aircraft surged to a height of 4.5 m before losing height. Wilbur was not quick enough to turn the rudder down. The aircraft sank to the ground, its nose up in the air. It had been in the air for just 3.5 sec. In the excitement, Wilbur forgot to shut the en­gine off when it hit the ground. The Flyer dug deep into the sand, splintering a strut and also a brace of the elevator. This was too brief a flight to bring cheer to the two men from Dayton. They set out to repair the aircraft and make it fit for another trial. It took them two days. "We are ready", Orville looked up, picking a few strands of wire that lay on the sand dune. "Tomorrow will be our day", Wilbur came from under the belly of the aircraft, after making the final check of the wheels. "I’ll alert John Daniels, Will Dough, Adam Etheridge and Bob Westcott to be present. This time, the aircraft, I hope, will stay up for a longer duration", Orville expressed his wish. That night, they could not sleep. Their thoughts hov­ered around the grand show, scheduled for the morrow. They tossed around in their beds, dreaming of the future. Gusty cold winds marked the dawn. But, by 10 a. m., the wind speed fell to about 30 kmph. Orville, Wilbur and the four witnesses hurried over to The Flyer, which rattled in the wind. "Heads I win. And tails you go", Wilbur pulled out a coin and tossed it up. The coin spun in space, came down and rested ‘Tails up’. "Congratulations, Orville. You fly first today", Wilbur smiled at his younger brother. Fig. 2.2: The wing warping system. propeller roared. The plane purred with life. Wilbur ran long, while Bob Westcott clung to a stopwatch. Daniels adjusted the camera, ready to record the historic flight. Etheridge and Will Dough removed the blocks in front of the skids of the trolley. The trolley picked up speed. The aircraft’s propeller rotated fast, giving the necessary thrust. The Flyer rose with a shudder. Soon it gained a height of about 3.3 m. For 12 sec it remained airborne, covering a distance of 36.3 m (Fig. 2.2). The aircraft was taken back to the starting point. Now Wilbur got on. He flew a distance of 53 m. The timing could not be recorded. Orville flew next, covering 55 m in 15 sec. On the fourth attempt, Wilbur flew 200 m in 59 sec. HILLS AND WAVES AT KITTY HAWK ON CAROLINA COAST. The report began with the words, "The problem of aerial navigation without the use of a balloon has been solved". It described Wilbur as ‘well-groomed, raven-haired and swarthy with piercing blue eyes’. Orville was ‘sandy­haired, with sparkling blue eyes’ (Fig. 2.3). It was a small beginning. Yet it was a major triumph. Years later, Orville noted, "I would hardly think today of making my first flight on a strange machine, even if I knew that it had already been flown and was safe. After these years of experience, I look with amazement on our audacity in attempting flights with a new and untried machine". Who would have heard of Wilbur and Orville if they had not been audacious and had lacked the courage to try the untried? If they had not dared, the credit for such a flight would have gone to Alberto Santos-Dumont. But that is another story.